This very old and interesting form of Qigong originates form the Shaolin Temple and is named after the 18 legendary guards of Buddhism. In this form of Qigong the various influences from Indian Yoga are still clearly visible. Luohan Gong is the mother of numerous popular Qigong routines. The exercises strengthen the muscles, bones and sinews – the whole body is filled with Qi. 18 Luohan Gong is interesting for beginners as well as advanced practitioners. Luohan forms part of Wai Dan – the outer elixir. The exercises intentionally create a Qi congestion at the desired spots, initially by means of willful contraction and stretching. This excess of Qi is then set free by accentuated releasing to flow along the meridians to the internal body areas to nurture the organs. What are the effects of Luohan Gong? Strengthening of the sinews, bones and the muscular system – improved posture and relaxation of the muscles – and as a result free Qi flow. Opening of the joints – increases the Qi flow. This is a key point of Qigong and Chinese martial arts. Qi infiltrates the bones – „Xi Sui Jing“ – washing the bone marrow. Calming and deepening of the mind, strengthening of the intention (Yi). Below you can find exercise instructions and videos for 3 selected Luohan Gong exercises. We stand upright with legs closed. Then we sink into the right foot while lifting the left leg as well as reaching out with the left arm in front of the body, the palm facing upwards. The fingers of the right hand are pointing toward the left elbow. Now we sink the body’s centre of gravity further gliding sideways with the left leg and shifting the weight to the left. While doing so the palms turn downwards and follow the weight shift to the left. Now both palms turn again and face upwards on face level. Now we shift our weight back to the right. Both hands follow the body and assume a position as if we wanted to grab somebody at the forearm (elbow and wrist) to pull him/her to the right while shifting weight. Thereafter we turn the hands once again and press the left side while shifting weight. In the final position both palms face outwards. The fingertips of the left hand are pointing forward, the fingertips of the right hand upwards. The left hand is at head level, the right hand at eye level. We are looking back over the right shoulder. Then we close legs and turn back to the centre. The hands touch at the fingertips. Now we repeat the exercise in the other direction, in total each side 3 times. 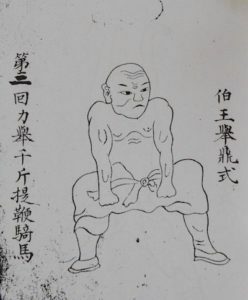 Now we step without interruption into the horse stance – Ma Bu – and press the back of our fists against the inner side of the thighs. Then we press the left fist all the way up and while we let it down again we press the right fist up. We repeat that cycle three times. When the right fist is up for the last time, we shift the weight completely to the right so that the toes of the left foot lose contact with the floor. With our weight we tilt forwards in the direction of the left foot while the right fist is pulled above the head in the direction of the ball of the left foot and the left fist is pulled backwards. Then we change sides. We repeat this exercise three times to both sides. After stretching for the last time to the right, we shift the weight to the front (right leg) into the bow step and press the right hand up, strongly bent with the fingertips guiding backwards as if we wanted to carry a serving tray. The left hand supports pressing upwards at the level of the right elbow. The gaze follows the upper hand. We hold this position for some seconds. Then we change position to the other side. Thereafter we finish the exercise and turn back to the starting position. We stand upright with legs closed. Now we pull the fists to the waist while stepping with the right leg closely behind the left leg. In doing so we only put the outer edge of the foot down on the ground. Then we grab the left wrist with the right hand approximately at shoulder level and pull the left fist down to the ground with the right hand. Then we turn back to an upright position and reassume the initial posture with both fists at the waist. We repeat the exercises three times, left and right. We turn back to the starting position and step a shoulder width apart. Now we lift the arms to shoulder level and look at our palms (Lao Gong points). While doing so we shift our weight into the heals and lift the balls slightly. We make sure that the back (Ming Men) stays open and remain in this position for some breath cycles. We then turn back into the starting position. We stand upright with legs closed. Now we sink into the left leg while pulling the arms apart on stomach level – in an arch-like movement and with a slight tension – and lifting the left leg significantly. We then turn the left foot out and put it down in front of the right leg and sink the centre of gravity. While doing so we press the right arm slightly above the elbow backwards behind the head using the back of the left fist. Thereby we stretch the entire right side of the body. We then dissolve the posture sinking into the left leg and pulling the hands apart on stomach level like an arch again. We repeat the exercise mirror-inverted to the other side. In total we repeat three times, left and right.